I'd like to introduce you to a spiffy concept: canning bacon. This entire technique was developed by my friend Enola Gay. In the past, Enola and her husband Sir Knight had purchased Yoder's canned bacon as a preparedness item. Trouble is, canned bacon cost an arm and a leg. And the first time they opened a can, they found to their surprise it was wrapped in paper. Paper in a can? Yes. So Enola, brilliant lady that she is, decided if Yoder's could do it, she could do it too. Then she taught me as well. Here are the steps. Start with bacon. (Duh) Here are six pounds, ready to can. You'll also need a roll of plain brown paper, about one foot in width. I picked this up at our local hardware store. Roll out the paper to about two feet in length. Lay slices of bacon on the paper, snugged up close against each other without overlapping. Put the slices head to foot if that will snug them up closer. How many slices do you put down? I have twelve photographed here, but depending on how thick the bacon is, you might get as few as nine or ten or as many as sixteen. That's just something you'll have to learn as you go. Cut the paper at the end of the line of bacon. Don't leave a "tail" of paper. Now lay another layer of paper over the top, and trim to the same length as the lower layer of paper. Here's where I lay a yardstick lengthwise across the bacon. To me, it's just easier to fold everthing over with the yardstick offering a guide. Now fold the bacon in half length-wise. Now starting at the end, roll the bacon up tightly. You'll have to sort of "tuck" as you go. Now slip the bacon into a wide-mouth quart-sized canning jar. You may have to screw the bacon package a little in order to get it in the jar. If you have too much bacon in the roll and it's too fat to fit in the jar, simple unroll it enough to remove a single slice of bacon, then try it again. ...and a few slices left over, which I cut up and fried for bacon bits for the baked potatoes we had for dinner. Lids on. You may have to push (squish) the bacon down into the jar if it sticks up too much over the rim. And DO NOT ADD WATER to the jars. This bacon is canned both raw and dry. ...and keep it at 10 lbs pressure for 90 minutes. When the bacon is removed from the canner, you'll find there's about an inch of liquid bacon fat at the bottom of the jar. Once the jars are cool, label and store. But what is the bacon like when it's opened? Doesn't the brown paper turn into paper mush? Is the bacon cooked or raw, crumbly or greasy? ...and spread open. The paper will be creased and greasy, but not disintegrated or crumbly. It's kind of messy to peel the paper off the bacon, but it will peel. By the way, some people prefer to use parchment paper, which should work just fine. I figger brown paper also works fine, so why go through the expense of parchment paper? Once the bacon is free of the paper, simply fry it like ordinary bacon. As I said, this technique is entirely Enola Gay's, and to her goes all the credit for developing it. I've canned up - oh, probably thirty or forty quarts of bacon so far (we love bacon!) and I couldn't be more pleased. In fact, Enola's technique is so interesting that Backwoods Home Magazine recently published an article by her on this subject! I am now prepared to hear all the feedback telling me why canning bacon can’t be done. timely lessons....pork has gone up 57% and rising. i see that you used a pressure canner.how long will i need to do this in a preaser cooker? You must not -- EVER -- can anything in a pressure cooker. A pressure CANNER and a pressure COOKER are not the same thing. 61. Can I use a pressure cooker to can food? No. A pressure CANNER and a pressure COOKER are not the same thing. If you own a pressure cooker, IT CANNOT BE USED FOR CANNING – only cooking. Pressure CANNERS have pressure gauges; pressure COOKERS do not. The gauge is necessary to determine how high the pressure is inside the canner. Size also is important. Most pressure COOKERS are too small to fit more than a few jars, if any. In order to be safe for canning, it must be able to hold at least four quart jars (that’s QUARTS, not PINTS). Anything smaller will heat up and cool down too fast, resulting in under-processed food. This isn’t to say there can’t be a crossover between the two – nothing prevents you from using your canner to cook (although my canner is too large and bulky for easy cooking so I use it exclusively to can). But never use a pressure cooker for canning. I saw this on Enola Gay's blog and set my mind to do it, but had to wait on bacon to go on sale. Well, it happened and so I bought 10 - 12 oz pkgs and plan to try it this weekend. BTW, if anyone is interested in some nice CANNING SUPPLIES, I am having a GIVEAWAY right now for a Ball Blue Book, a Ball set of canning utensils, a cute timer shaped like a tea kettle and chocolates and tea to dine on after all that work canning bacon!! Just click on my name to go to the website and click the blog button for directions to enter. Drawing is Feb 1. Can't wait to try the bacon and will be canning sausage at the same time - the ol' Tennessee way !! Some nice information to have. Thanks for the post!! I was reading this thinking, "Bacon? CANNING BACON???" But that's awesome that she found a way, and that you showed us. Thanks for the tip! We're not huge on bacon for some reason, but if I ever get a pressure canner (it's on my list) I'll have to give it a shot. I don't really see why you couldn't can bacon: I mean, it's been in the pressure canner for 90 minutes so it's not like it's raw or anything. Leave it to Enola Gay to figure it out, lol. I love her blog, too. Wow! Thanks for the great step-by-step pictures. Bacon may have to be the first thing I can when I get my pressure canner next month. I think canning bacon may be a good thing if you have to buy your own meat and don't want to be limited in food choice. But I think old fashioned low tech hanging side meat and country hams is probably a better way.Just wash the mold off with vinegar. Storing cooked bacon, ham or sausage in grease filled crocks is also an efficient and no electric method. The food is preserved because the air is blocked by the grease. Canning bacon uses energy, where as hanging cured meat in a cool pantry, attic, cellar or packed in a crock requires no energy. Of course the food has a limited shelf life, but then again, should we always have any food whenever we want it without regard to natural agrarian cycles? Some people will tell you that clostridium botulinum can survive in high fat foods like lard, cheese & bacon. I suppose so but don't really worry about it (maybe in mashed, packed beans too...). I think what I find really interesting is that a younger generation of women (men too) have come along that want what I would call for a lack of a better word "convenience" canned foods. I wonder if the notion of canned refried beans, canned bacon, canned cheese (okay slap me- I can't get off the beans) isn't a result of consumerism and a perversion of the idea of work? So many foods that we take for granted today came into existence only since the so called "women's movement"in the 70's when women went to work for someone else instead of themselves and their families and basic kitchen skills where slowly lost. Could it be that "convenience" canned foods simply a break in the chain of household food production? People raised on canned chicken noodle soup are often dismayed to find that there really is no satisfactory home canned version. But after all how hard is it to open a jar of home canned chicken stock and add dry home made noodles? Does the dismay come from a perverted worldview of food that has been groomed by large agri business? I don't know. The point of my comment is that I don't think it is always desirable to can everything. The extra step in preparing favorite foods isn't that much harder and might make for a greater appreciation of that food when it is in season and a greater appreciation for the animal who's life provided it. I agree with your comment. I am younger and grew up on pizza's, fast food, and Microwave meals. I am trying to learn the old ways but I dont know of anyone to teach me. I have thought many times that if there were no grocery stores I would be lost. I have started a food storage but I am not prepared to know what to do once that is gone. I also agree with you in regards to the downfalls associated to the women's movement. There have been so many negative changes to our country. I have not done an extensive amount of research but I have some theories. Get around the theories and look at the community centers for someone to teach u the old ways ,just ask I am sure someone would love to teach you and they would probably enjoy the company. As with the days our children are too busy with other things to carry on the old ways. Convenience is not the only reason to can stuff. And it has nothing to do with ingratitude. You write like someone who's never canned. So other than a thinly disguised put down, and the implication that food caners are spoiled and lazy, what really was your point? Thoughtful and reasoned consideration should be given to everything we do for our families and in our homes. There are older and sometimes better ways to preserve foods without the use of energy. Bacon and other smoked meats just happen to fall into that category. Well cured hanging smoked meat will last from season to the next. No needed to can it. Anonymous seems to be rather crabby. Granny, I don't believe your post was in ANY way insulting. Clearly, this person is either ultra-sensitive, a sciz, or has some other mental issues going on. The indoctrination camps do this to people these days. Please continue to post here. Most of us find the information helpful and we appreciate it. Not everyone has the space for Old fashioned technology...like crocks in the cellar. I for one do not have a cellar. I grew up canning everything that would fit in a jar including bacon. It seems to me from you post you are calling those of us who can lazy. For Anonymous: You don't know what you are talking about. I grew up in the south, and it wasn't uncommon to see a smokehouse in the vicinity of every home built before the 1960's. My grandfather and his grandfather before him preserved hams, side meat, fat back and other meats by salt curing and hanging. Granny is dead right. You don't need a cool basement, the salt is the preservative and from way back the folks used "skipper" compound to keep bugs off the meat until the salt cured it. Once again your crock theory is a crock. Pickles and sauerkraut were the primary thing to be placed in a crock, and the crock didn't have to be in the basement either. Canning sausage WAS a necessity, but the bacon was generally smoked side meat and salt cured. It wasn't necessarity a southern thing....I have been all over Europe and exquisite flavors from dry/salt curing meats is preferred. Ever tried canned proscuitto? Stop being so sensitive, Granny knows what she's talking about, and apparently you do NOT. Granny Miller- I guess you are taking time off from your blog to also be slightly cranky on other blogs. Shame on you. I guess you would consider my grandmothers canned beef stew meat, canned pork, and canned vegetable soup base....... convenience food. She was born in the very early 1900's. I learned a lot from her and still use some of her ways of doing things. I am in my 50's and I'm still learning and trying new ways- such as canning bacon. When you are being critical of women in general- remember we don't all live on a farm like you do- some of us who can, freeze, and dry foods - can't have a garden or raise our own meat-we tend to buy in season bulk or on sale bulk to feed our families. Is your problem really the canned "convenience" (your term) foods or something else? Why are these people bullying Granny so much? They behave like liberals. I 'can' or dry everything. I have a very well stocked pantry. While I'll admit it's easy at the time I'm making dinner, it's far from being a convenience! The time it takes to do all that canning probably adds up to weeks,dawn to after dusk not 9 to 5, of hard labor. I know there are a lot of different 'old fashioned' ways of preserving foods, but they phased out with most people when reliable canning was invented... FOR A REASON. And it wasn't convenience. Washing the mold off a hank of stinking meat in the cellar and eating it was as often the beginning of a week of sickness as it was the beginning of a good meal. I have no intention of living a lifestyle from 500 yrs ago, which meant watching 4 out of 5 children die before they reached adulthood, as often as not because of bad food. I will, as long as possible, keep my family as close to the 20th century as I may because it's the first century EVER that a person could say "Children should bury their parents. It's just wrong for parents to bury their children." The people of 500 yrs ago were smart enough for their times, and for the most part prospered. But it was a short life, and often ugly. If we've learned anything since then, it's that a lot of what they did on a regular basis, was just wrong! I'll keep, and continue to learn to improve, the new ways of doing things the old fashioned way, thank you. I fear you are completely missing my point due to the limits of Internet conversation. I'm attempting to make a philosophical point and and I have obviously failed. My point is not about canning per say - it's about the loss of basic domestic knowledge. I was in fact so concerned about the loss of that knowledge that I made HOME CANNING BASICS and authored AMERICAN HOME CANNING. It is EASIER,cheaper and faster to store bacon as side meat and cut it as you need it. It's my opinion that canning bacon is time consuming and expensive and that the old way is the better way. No need to re-invent the wheel. If you would like to continue this discussion please email me & I'll be happy to further explain. I've opened a can of worms! It's not my intention to high jack the comments on this post. Should I go away or respond to Barbara? Apparently my point about lost traditional domestic skills is being proven. Seems like people don't know about smoked or cured meat. Granny, I don't mind (and even encourage) spirited debate as long as everyone STAYS POLITE. If folks refrain from name-calling or bad words, I welcome a vigorous exchange of opinions and ideas. Please see my comment to Leota Susan about convenience. I attempted to make a philosophical point and obviously missed the mark. That the older way is in my opinion the better way. That the last two or three generations do not question the consumerism or worldview of grocery stores and TV - hence re-fried beans and canned chicken noodle soup are considered standard fare. That we as a Nation and a People have become perverted in our food and labor expectations. That somethings can't be improved upon. That the philosophy of a continuous material progression might be be wrong. That perhaps life should have limits and we shouldn't eat whatever we want, whenever we want. That nature and natural cycles should be respected. And just so you know, there is a method of preserving meat - especially pork - known as "dry curing" "sugar curing" or "smoking". Morton sells a very good product for this and it is easy to do at home. What passes in modern grocery stores today as "smoked meat" is not. It is meat that has been treated with chemicals to impart a "smoked" flavor, but nothing has been done to the meat to preserve it. If you were to take 10 lbs of grocery store bacon and keep it from refrigeration it would very quickly begin to spoil. True cured or smoked meat is treated with salt, sugar, saltpeter and other spices and sometimes smoked in a special "smoke house" for about 7 to 10 days maybe more depending upon the size of the ham or slab of bacon. Sometimes a special saline solution is injected into a ham near the bone to speed the curing process. The entire process is more than a little like mummification. The resulting meat product is reduced in moisture by about20 -45%. This makes hams, bacon and other "country" meats safe to be stored at room temperature. Sometimes a special type of mold will grow on the ham or bacon. This mold is harmless and is easily remove by wiping it with regular vinegar. When a slice of meat is cut from the bacon or the ham it is important to grease over the place that was cut with shortening or lard. By putting grease on the cut area air is prevented from entering into the meat. Well cured meat will last up to 4 to 9 months. Some people can get their hams and bacon to go from killing season to killing season - January to January. Barbara, this is a very safe method of meat preservation and is still practiced here in Pennsylvania; and in West Virginia,Tennessee, Kentucky, Georgia and other Appalachian regions. One type of Italian specialty meat known as prosciutto is made in this way. You can try prosciutto in many delis. There is a method of packing cooked meat into a sterile crock and covering it with hot grease. Spoilage does not occur because the grease prevents air from getting to the meat.Sausage links and patties are best for this method. There is also a method of meat preservation known as "brine cured". The meat is kept under a heavy salt brine for a couple of weeks. Corned beef is made this way. My husband just told me that there is an article in the recent COUNTRYSIDE MAGAZINE about home curing meats that you may want to have a look at. Well, I find myself agreeing with both sides. How very uncommon. I agree that today's bacon is not at all like bacon from 150 years ago. Today's bacon won't last outside refrigeration, as Grannie Miller has said. But I also agree with those who say that canning today's bacon is a good way to preserve it so that refrigeration is no longer needed for it. What's the harm with canning it if you can't do your own smoking or curing? I see no harm, instead I see innovation and self-reliance - two qualities I admire. As much as I wish I had a smokehouse, my state won't allow me to build one. Should I then give up eating bacon when the poop hits the propellor? Not likely, I'll eat the canned stuff, thanks. What concerns me about canning bacon is the paper used in the process. I worry about the chemicals in the paper from the hardware store. Parchment paper that is used for baking would be fine, I suspect. But paper used for masking, for example, may have harmful chemicals in it. Could those chemicals be leached out during the canning process? I suspect so. Although I'm not particularly worried about non-organic foods or preservatives in my food, or even GMO foods, I do worry about chemicals that may get into my food from paper that is not rated as food-grade. I'd definitely consider using food-grade parchment paper if I were to can bacon. As a disclaimer, I should point out that I am a very poor cook and I haven't canned anything since my mother passed away over 6 years ago. Your entire presentation fairly reeks with a condescending tone and an assortment of glaring self contradictions. A simple message about old time methods and the 'philosophical' aspects of their practice and application could surely be accomplished with greater clarity and economy of words than you have put forth here. Your purported message is one thing, but the attitude conveyed throughout the thousand plus words in which you bury that message is quite another. The steady stream of negative assumptions and character judgments running throughout what you write belie your claimed intentions. Clearly, your mastery of the various old time methods of preservation have not hindered your acquisition of more modern skills, such as presumptuous self promoting intrusions onto others' websites. Another good aspect of this method is the reduced fat you're getting in your final preparation. Between the solidified fat and what's absorbed into the paper it appears reasonable to think it could be a substantial percentage. In a post EOTHWAWKI situation one might think about using the used bacon paper as an ingredient for making torches. The smell might be bear and panther bait, but I bet they'd burn pretty well if they were wrapped in rags or some other combustible material. Thanks for another valuable and entertaining post. Please pass along my thanks to Enola Gay. Side note...it's just begun to snow here. I can see your point of view. Sorry you took exception to my comments. Negative assumptions and character judgments and a presumptuous self promoting intrusion were certainly not my intent and I sincerely apologize if I have offended you or anyone else reading these comments. Patrice asked food feedback about "why canning bacon can’t be done." My feedback was more along the lines of why canning bacon maybe shouldn't be done. I question the use of canning technology for this particular food product. Why go through the trouble and expense to put only 1 lb. of meat in a quart jar, when a quart jar actually holds 2 - 2.5 pounds of meat? My thanks to Enola. That was very infomative. The power of the mind has me smelling bacon right now. I am sorry, I guess you never mentioned frying bacon. When you say bacon, I always imagine bacon "classic". Ahh the good old days. Now it's Baco's chips. HAH ! I have done it on a glass top range and the problem is keeping the heat accurate. It is SO VERY DIFFICULT to keep the heat consistent. I only use it as I do not own my home and the only cooktop is the glass top range. However, I have a camping cookstove that is propane and decided to use that instead and it works MUCH better. Good luck! I know several people with glass top ranges that have broken from pressure canning. What type of canning lids are you using in that bacon demonstration? They look ceramic? I've become a huge fan of Tattler lids and bought a lifetime supply (http://www.rural-revolution.com/2010/09/my-lids-are-in.html). They now have become advertisers on my blog - see the ad on the right-hand side and click to visit their website. Tattler lids are perfect for Preparedness-minded folks because, once bought, you never have to buy canning lids ever again. How cool is that? "Bacon and other smoked meats just happen to fall into that category. Well cured hanging smoked meat will last from season to the next." Depending on where you live, and how your house is set up. Some folks are lucky enough to have an old (sometimes drafty!) farmhouse with root cellars or whatnot that was built for this kind of lifestyle. Other folks do not. For example, I live in small town on 1/3 of an acre in what our family could actually afford (vs. over-extending ourselves into an abyss of debt for 20 acres beyond our budget). Not everybody has an ideal setup. I've been attempting to store winter squashes and garlic and onions and so on in my garage (and tried keeping garlic in my pantry), but with the swings of temperatures in my neck of the woods, it's not exactly a screaming success. "When a slice of meat is cut from the bacon or the ham it is important to grease over the place that was cut with shortening or lard." If you have a steady supply of shortening or lard. I cannot raise a pig for the lard, so it would be Crisco for this purpose in my household. Which seems to negate the whole idea of DIY'ing your own meat storage if you constantly have to buy shortening from the store. Not everyone everywhere can do everything the same. Home is where you make it and just about wherever you live you can be more self-sustaining. A 1/3 of an acre can grow a lot of meat & vegetables if you have the sun. But how does buying Crisco negate DIY'ing meat storage? Is it DIY'ing to buy the electricity or natural gas to can the bacon? There is no such thing as a 100% self-sustaining household. but since you bring it up .... I think everything comes down to personal philosophy about the nature of life. "Should I be eating this?". "Is it moral to eat this?" "What is the true cost?" "Is there animal or human suffering in this food?" St. Paul has something to say about this topic and I tend to agree with him. After all, who am I to disagree? Never the less, I don't think it would hurt for most people to be a little more cognizant about what food actually is. In fact I'd go so far as to say that if Americans had never lost the real connection with their food and faith there would be no need for "prepping". That said without knowing your particular situation,if I were in you I'd lay down bacon in a clean sterile crock. Cover the bacon with the hot bacon grease. The grease will prevent air from getting to the meat. Cover the crock and put it somewhere cool - maybe a garage? The bacon will last until the weather begins to warm up. Try and have it eaten up by the time daytime temperatures are steady above 55F. People are concerned about so called TEOTWAWK and other scenarios. Canning food takes energy - not just human. Usually wood, coal, electric or gas. The information I just provided is a low tech/no tech way to manage part of your family's food supply in the event that we really do live to see "the next economy". It is my opinion that it's the appropriate technology for this particular food for most of the year if you cannot manage side meat. Now if energy and material costs are not an issue, and there is no philosophical or moral impediment to eating a factory farmed animal or eating out of season, then I think canning bacon is probably the way to go, especially in a warm climate. The only change I would make would be the paper. The comment left by Anonymous Patriot, is well taken. Heaven only knows what masking paper is coated with. I would use a paper that was manufactured to be "food safe". Are you supposed to put water in your canner? YES!!! There is water in the canner - a couple of inches at the bottom. You cannot can with a dry canner - it will ruin it. I tried this last week. it seemed the canning went well. My wife just open one of the pint jars and said it was crumbly and just fell apart as she peeled the paper off. What did I do wrong? I did not get the nice looking strips that you had. I had bacon pieces. Any help would be a great help as i was going to can another batch this week. Sean, I can't imagine why the bacon would be crumbly because, for all intents and purposes, it comes out of the jar RAW. BTW, you said she opened one of the PINT jars? Why did you use pints instead of quarts? You may have to walk me through every step you took to determine what went wrong. Post the steps here (so others can learn as well) and we'll see if we can figure it out. We used pints because they fit in our small canner. 1. I used brown lunch bags placed the bacon strips on the paper, side by side and wrapped just like in the pictures above. 2. I folded over about 3 inches of the paper covered bacon on to itself to fit in the small canner. 3. We placed 2.5 inches of water in the canner. 4. placed the canner on our globe wood cook stove. The stove top temp was 350 f.
5. it took about 45 minutes for the pressure to get to 10 psi. once it did i let it vent for 10 minutes ( just like i always do) to ensure that all the air is out. Then i placed the weight on the canner. 6. Canned for 75 minutes at 10 psi. I never let the stove top get above 400 even after adding wood tot he firebox. 7. removed from stove top, let it set until cooled then placed on the shelf. I will say this is second item canned on the wood stove we also canned 7 quarts of venison burger. We just purchased the wood stove two weeks ago. Also this bacon was in our freezer for about 6 months before we canned it. When you took the canned bacon out of the jar and it was crumbly, did it still look raw or did it look cooked? The bacon cooked up just fine and was good. I just need to figure out why it crumbled. before she will let me can anymore. Would thick slice make any difference? I'm at a loss. Thicker slices may indeed help, but I don't think it should crumble regardless. I'm going to ask my friend Enola Gay and see if she has any thoughts, and I'll post her reply here. For preserving any meat product I'd trust pressure canning over simply layering cooked meat in its own fat and hoping I can keep it cool enough not to spoil. Hanging meat to cure also requires a smokehouse and the addition of a significant amount of salt. Even though I have no sodium restrictions, I find commercially cured (no refrigeration) meats much too salty to eat on a regular basis. thanks for your help on this Patrice. I only have one concern. When you are on the "cutting edge" of food preservation, and don't have tons of historical reference information, how do you determine what the safe shelf life is for something like this? Sometimes appearance is obvious, other times odor is a big clue, but neither is fool proof. I reckon you could open a jar every six months and feed some to the dog, and if the dog shows no ill effects then try the neighbor's kids. Sooner or later you're going to have an answer. I just perused this article because I can't wait to try canning my own farm raised bacon! I am severely allergic to the by-product "bisulfate". In fact it is so severe, that most of my allergic episodes occurred as a result of eating some food or drink that was processed with a bisulfate in it and I was not aware of it. So, heads up! If you are allergic to SULFA meds, do not, use Morton's cure to process your pork ham hocks. It also is included in most dehydrated foods that tend to "turn color" in processing. Foods like canned apples, potatoe flakes, and sometimes even carrots. Also, many commercial meat packers use it to "pickle" hogs feet, pickled eggs, and the killer of them all...Is it is widely used in just about all bottled RED Wines and some white varietals as well. Whoo-hoo! Let me know how it turns out. The local meat market had a special for 40 pound boxes of fresh boneless skinless chicken breasts at 1.69 a pound, so I bought a box and am currently canning some of it. I might even go back for more. That's quite a deal. I know how to do many things without electricity, natural gas coming in a pipe, or running water. But while I have all those things, I might as well USE them. The more loads of wash I run through an electric washer and dryer, the less worn-out I will be when there is no power (and that already happens frequently enough.) And the more luxury, high engery food items like meat that I have stored, the less it will affect me to watch the prices soar, as they've been doing, and continue to do. I will have the energy to plant my corn, acorn squash and carrots because I ate a good meal. Cranky Miller, you can eat all the "wipe the mold off" meat you want. Keep some antacids and your doctor's phone number handy. I can imagine if you didn't have electricity and running water, you would not be running all those loads of laundry .. you would be wearing the same two outfits (everyday and Sunday's best) .. our modern world wastes such energy. Granny Miller is only giving instruction on the lost skills of homemaking ... that doesn't deserve such a smack mouth response. I think canning bacon makes good sense for me. I live in South Texas we have very hot weather. We cannot realy keep hanging meat or crocks of meat. Houses here are built without basements and if you had any meet stored that was not dried or canned it would be at the mercy of your freezer or air conditioner weather it would last. We can put our canned items in a dark closet and even use a fan but we cannot keep a constant "cool" temp without using lots of energy. This has been a very interesting article and especially the comments afterwards. I've been enamored of the idea of canning bacon like Yoder's to decrease it's cost for preps, but definitely fear the food poisoning. As for Granny, there's a reason I stopped reading her. Cranky is one. Killing pigs in front of their friends and then just waxing poetic about watching the reactions to the ones that are next is another. Everything has a season, cruelty never does. And no, about 50% of the U.S. is unsuitable for hung meat of long duration due to climate. And yes, I do know that. Unless you do some massive excavation, serious climate control and a whole lot of energy is used to keep it just right. I grew up with a smokehouse that was almost 300 years old. I didn't know ham came in less than 2 year old varieties. BUT, most people in today's world can build an entire mini-mountain to keep the smokehouse climate correct. Why would anyone can worms, let alone open one? 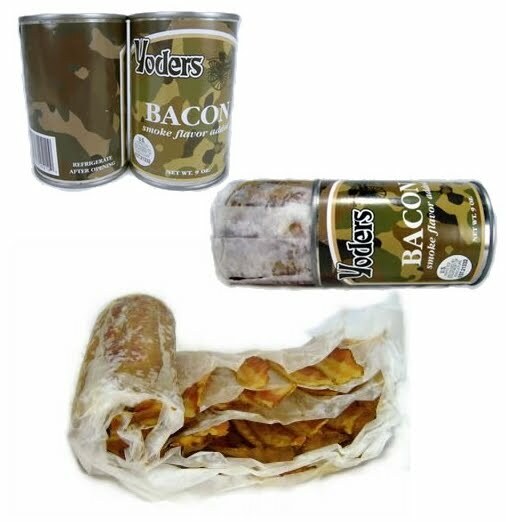 We have a case of the Yoders canned bacon. It appears fully cooked when it comes out of the can, unlike this bacon that needs further cooking. Is there a reason you don't cook it longer to fully cook the meat? I've never seen actual Yoder's bacon so I've had nothing to compare the home-canned version to. I've canned cooked bacon bits and they turned out fine, but I rather like the flexibility of canning raw bacon -- this way I can cook it hard (for bacon bits) or medium (for regular eating) as I prefer. This is a different subject but how long can you safely use home canned tomotoes, apple sauce, berries, or other water bath canned items? Anon 3:05, if your items have been PROPERLY canned, i.e. they stayed in a boiling bath for the correct amount of time, then the canned food should be good for years. I've made pies with apple pie filling that was eight years old (left over from our beloved trees when we lived in Oregon) and they were great. BTW when you water-bath tomatoes, make sure they are heirloom varieties. Modern hybrid tomatoes are lower in acid than the heirlooms and will need to be pressure canned because they don't have enough acid in them to be safely water-bath canned. Thanks for your answer. I am not sure they were properly canned. Well, the applesauce and berries were but not sure about the tomatoes. I used the proper amount of acid (lemon juice) in them to make sure of the acid but used my old canning book which said to proccess for 35 min. with raw (and cold) pack. I am thinking I might have to redo with fresh tomatoes this year. I just stumbled on this conversation today. What a NEAT blog! I can understand BOTH points of view. I actually liked Granny Miller's point of view very much and didn't find her "cranky" at all. What I gleaned from her comments was that there are many ways of preserving besides canning that may be better or easier or available or whatever, but those ways are being lost to time. I think she was also talking about eating food in season for your area and also not relying too much on "convenience" foods, which many people now mistake as "staple" foods. On the other hand, being an avid canner myself, I can see why people would want to can bacon and everything else. It's true that it takes time and energy, both human energy and wood/gas, whatever. It's true that there are other ways to do it. But what's neat about being able to can it is that once it's done, it's done. You don't need a refrigerator or electricity to keep it. You don't need a smoke house. You don't need to smear lard on it or submerge it in oil. When properly canned, it will last for years. I LOVE CANNING!!! I think we need a marriage between BOTH ideas: Granny Miller's ideas AND canning foods--any kind of foods, convenience, whatever. If you have the room/space/climate, etc., to smoke/cure foods and keep them that way, then have at it! If you don't, canning is great way to put food by that you wouldn't ordinarily have if the poop ever hits the oscillating device. As for me, I will keep on canning, but I am also trying to learn the "older" ways of preserving things. I've read lots of Sally Fallon's ideas and have used them with GREAT success--and without a water bath canner OR pressure canner! I live in a cold climate right now, so I will try to learn what was done in MY area for food preservation. My husband wants to move to a very warm climate in 10 years, so I will have to relearn everything all over again! I'm sure that people in hot climates were able to preserve food. We need to find out what native Americans did in Texas, etc., to preserve meat, such as "charki" (jerky). Thanks for a great post and a great blog! The post by Anonymous December 5, 2011 1:49 PM is no doubt the most sensible post so far, for me anyway. I can and am going to try canning bacon today, but then I wish I knew how to safely cure bacon and ham too. We used to buy DAK canned bacon almost 30 years ago when we lived overseas. I loved it! Remember to scrape the paper to save every bit of that wonderful bacon grease! This is awesome! There is a German butcher shop that we detour to every time we head to Dallas, and stock up on their fabulous smoked bacon. I hate freezing it because I have to thaw it to use it but we buy waaay too much to just stick in the fridge. Next time we go I'm going to load up and can the lot of it! I am very glad to hear all the comments here. Living on the west coast,I can, freeze & dry just about anything possible. I would sure love to have a cool place to have cured meats, but where I'm located its impossible. I can remember my Grandfathers smokehouse when I was young, and buying Dak & Plumrose canned bacon as a young mother, before I even started canning. Now that I'm "mature" ;) I take advantage of all sorts of safe preserving methods that were not available then, but very much value the old methods that have been found to still be safe. Thanks very much for all the information. Bottom line? We all want to eat...We all want to survive...and We all want to do so as comfortably as time and location and means at our disposal will allow. Is it somewhat of a luxury? sure...Is it good? Absolutely! The fact that any one of us is here reading this post or responding to any of the content is proof that smart people will both survive and flourish no matter what gets thrown at us from Nature or elsewhere. After a year, I finally opened a jar of our canned bacon that I wrote about, and it is DELICIOUS. Not crumbly. Looks pretty much like it did when I canned it only I actually think the texture was a little better. The grocery sacks? I'll do that again. Worked great. And FREE. I am learning how to can and I have no clue of the other ways of preserving food but I do like the size control of canning jars..,quarts and pints. Where I am unfamiliar with the drying and grease packed preseving methods I would have a BIG fear of eating things preserved with those method even if safe, maybe in the near future I will take time to learn of these other methods. Question: Since you can quarts in the Pressure Canner for 90 minutes, isn't the bacon then "cooked" and edible at that point? I prefer it fried to a crisp texture, but I would think it would be possible to eat the bacon right out of the jar as it at least would be cooked and safe? Thoughts? The bacon would be sterile, so presumably you could eat it right out of the jar... but frankly it's still half-raw. Frying it (or baking it on cookie sheets, which is my strategy) makes it MUCH more palatable. I absolutely agree with frying or baking, even micro-waving it, but in a SHTF situation, one might not have that option. 90 minutes in the pressure canner should cook the meat I would think, but even if it is cooked, I like it crispy. And, thank you for the quick response. I have two quarts in my smaller pressure canner as I type and can't wait to see the results. I used parchment paper and thick sliced bacon. I used 12 slices in the first jar, but in the second I found I could get 14. Patrice, what do you suppose the real shelf life is? ....oh, just heard the jiggle, must set my timer. Properly done, canned meat is good for years. I've eaten ten-year-old meat I canned, and it was fine. Now obviously if the seal is compromised or the meat smells off or bad, then it should be discarded WITHOUT tasting in a place where animals can't get to it. But otherwise it should have a shelf life of at least five years, probably more. ~Not hard to get it ready for the PC. ~Jars sealed and bacon really looks good in the jar. ~When opened, the bacon came out as it went in. ~Fried up quickly on my cast iron griddle. ~And yes, taste great! I fried until crisp. ~Myself, wife, 11 year old son and MIL gave it a thumbs up. ~Paper was soaked with dripping bacon grease. No surprise here. am glad at this point I used THICK sliced bacon. point and it made it much easier to transport to the griddle. and tators! That is my main reason for canning this, emergencies. I am an avid canner and came across your blog this evening, looking for unusual items to add to my collection of recipes. I am totally intrigued! My delimma is this...I live at 9200 ft. How do you adjust the canning pressure? Typically, I pressure everything at 15 lbs and not change the timing but you are already so close to what I use that I'm a bit confused. For your elevation, 15 lbs should be fine. All meat products (bacon included) will need to be in the canner for 90 minutes (for quarts). Give it a try and see what happens! I have a lot of "freezer paper" that is sort of shiny and smooth on one side. I wonder if I could use this to can the bacon instead of the brown paper? I just don't know what the paper is actually made of - it holds up fine in the freezer but I wonder if the heat from the canner would cause some problems. Has anyone tried using freezer paper? First, let me say thank you once again for the easy way you present canning bacon. I think it is the best thing since sliced bread! I have a question if I may: You say the grease turns white and into lard. Mine turns some into a white lard and some stays liquid. Now mine have been sitting on a pantry shelf for about 3 weeks or so. Is it normal to have both "white lard" and liquid bacon grease in the canned jar? Maybe the liquid isn't real bacon grease and some sort of additive that was injected in the bacon before packaging? I'm guessing here...On-the-other-hand, when I fry bacon and pour the hot bacon grease into my bacon grease keeper, ALL of the bacon grease turns a solid with NO liquid. I'm at a loss to explain this. I just checked my canned bacon and it too has some liquid at the bottom, in addition to the solidified lard. I'm guessing it's greasy water since meats have a water component. Whatever it is, it doesn't affect the quality when the bacon is cooked, so I wouldn't worry about it. From Richard Keistler in Texas--30 years of canning and it never occurred to me to can bacon. For many years I've been cutting up cheap bacon and vacuum sealing it in little baggies just for seasoning for beans and other foods when I cook them. This is a perfect method for more expensive bacon and we're not under the gun to use it up so quickly. Thanks to you and Enola Gay! Thank you for this post! I canned 14 pints (wide mouth) this week. I had the same problem as commenter Sean on January 15th 2011 8:01 am. My meat also did not stay in strips, but fell apart as I tried to remove them from the paper. Cheers for bacon bits! My theory as to why has to do with the fact that the wide mouth pint jars have straight sides and the wide mouth quart jars have a little bit of tapering at the top. In the quart jars the paper may not (I have not tried quart jars yet) touch the sides of the jars. Air may able to circulate and (maybe) dry the bacon just enough so that it does not fall apart. In the pint jar the whole thing is full, touching every inch. Maybe the pints would work if only a few slices at a time are canned and room is left around the bacon. That seems like kind of a waste of space, but I will try that along with canning it in quarts to see if I get a different outcome. P.S. I used pint jars because there are only three in my family who will eat bacon. I love your blog, especially with all the wonderful pictures! It makes canning so much more fun, & easy to understand for me who is a visual learner. I canned my first 7 quarts of bacon today! yahoooooo! it looks yummy! Can't wait to try it when my husband gets home off the truck in a couple weeks. looking at it sitting on my table with all my canned carrots, it kind of reminds me of homemade caramels at christmas time, seeing the orange liquid grease & then white solid grease and then the bacon showing through the parchment paper. Do you prefer this method over bacon pieces? I do have limited space in storing my canned goods and just wondered, if space is an issue, which method you might prefer? Thanks for your input. I read you everyday, even if you haven't posted anything new, I will go to the previous posts! Any when my daughter gave me the Simplicity Primer, well, I thought I was sitting on top of the world. Please keep up the good works! If space is an issue, go for bacon bits. You get more bang for your buck (space-wise) that way. In fact, even though I have a fair amount of bacon slices canned up, I'm canning up a lot more bacon bits lately for two reasons. One (as I said), you get more bang for your buck in each jar. And two, bacon ends are cheaper than sliced bacon, so it's easier to afford. At the price of bacon these days, that's a serious consideration. Thank you for your kind words on my book! Tried canning it recently. 6 thick slices in parchment paper, processed 60 minutes. Coming out of the jar, appears fine, but when I try to brown it in pan, it falls apart, resulting in 'crumbles'......fine to put on bacon/egg sandwich, but no way could I keep it in strips. Yoders is clearly pre-cooked before it goes in the can. It only takes a slight heating in a pan to crisp up, and doesn't fall apart. My thought is to try that next, and see if I can duplicate their method. They get 3 to 3 1/2lbs of cooked bacon in a can ( don't know can sizes, but it looks just slightly larger than a soup can in size ).....I think I counted about upper 30 some strips per can. First of all, watch your canning times -- ALL meat should be pressure-canned for 90 minutes (not 60) for quarts. Don't under-process! By all means try pre-cooking before canning, and let us know what happens! As I said, though, don't under-process anything while canning -- that can lead to botulism. Thank you for the detailed instructions. The pictures are great. You spent some real time putting all this together. it isn't that you 'can't' can bacon, it's that it's NOT SAFE. You should at the very least put a disclaimer to proceed at your own risk in case someone follows your advice and gets sick or dies. The high fat content in bacon actually protects the botulism bacteria and heating it kick starts it into action. I'm sure I'll get blasted but this has to be safe. We just CANNOT mimic the same safety/procedures/time as commercial canneries. Who would have thought bacon could be so controversial. I am going to have to agree with Cyn. We are HELPLESS without big industry/gov protecting us. This blog should be censored for the common good. Whats the shelf life on this? P.s. thank you for the info! The Wife and I are excited to start jar'n Bacon! Having canned a lot of bacon slices as well as bacon bits, I'm forced to conclude that canning bacon bits gives a lot more bang for the buck over canning bacon slices. The reason is because slices waste a lot of space in the jar. I've got about 30 quarts of bacon slices canned up, but once the jar is opened and the bacon cooked down, there's not much in there. However with bacon bits (which I can in pint jars), the jar is PACKED with no wasted space. I have to buy Beef Bacon When my Store gets it (which just isn't often enough)because I am Allergic to pork. This may be the solution to my overstuffed freezer. I am going to have to try this but first on a smaller scale. Would butcher paper work better? Just found your blog. Love it. My grandmother always canned bacon and I have done it on occasion. Very similar process only we use waxed paper. Can't wait to go back and read all your posts. I have since found, BTW, that there's more "bang for your buck" by canning bacon bits rather than bacon strips. Just FYI. There currently are no safe guidelines for canning bacon. In fact bacon is not even considered a meat for canning purposes but is considered a fat. In light of recent events in Ohio, I would strongly urge everyone to only use safe tested recipes from reliable sources such as Ball, NCHFP to avoid another heartbreaking situation. I was reading some of your older posts and came across this one on canning bacon. In one of your other older canning posts you mention that canning fat is not good because of the protection fat affords botulism spores. Several things come to mind based on your and Enola's success with bacon. The first thing was that you both cooked the bacon prior to eating, and I have read that heating to the temp of boiling water will inactivate the toxins created by the botulism spores. This does not mean that temp will kill the spores just the toxins which is what will kill you. Is this possibly the way our grandmothers could get away with water bath canning things like green beans? They knew to boil the canned green beans before eating. We no longer have to do that because of commercial canned foods and microwaves. Dump it out of the can nuke it for a min or so and then eat. They used to put the contents of the jar into a pan and boil it prior to eating. All of this is just logical thinking on my part and is not based on anything but to me it makes sense. What an interesting post. Thank you for all of the information. I have purchased the *very* expensive canned bacon as a "treat" in case things get gnarly. It was great reading all of the comments also. I am a male from the boomer generation and I garden, can, freeze, cook, hang clothes on the line etc. But I grew up on a 4th generation farm in rural Montana when Montana hadn't been infiltrated yet. We never used 10 different cutting boards and sterilize each one and we ate home canned goods years after the "safe guidelines". Common sense is the key with all home preserved foods. If it looks funny, if the seal is broken, if it smells even a little bit off... don't eat it! A friend of mine recently mentioned he wished the warning labels on *everything* would be removed to weed out... hehe. I'll leave it at that. I have never canned bacon and am chomping at the bit now! Can't wait to do it. I will put it aside for a "treat" if/when things get gnarly. Thanks again for the great post. My "other half" informed me today, via text, that life would not be worth living without bacon and sent me the link to your site. lol We are totally new to canning, but are going to give it a try! And now....we will still have our bacon! lol Thank you!